There are definitely homes that you walk into and immediately get the vibe, this was decorated by a professional. Well, with all the advice on the internet and home design stores (especially discount ones) you don’t have to drop your money on a professional these days. If you can afford it, go for it. But, if you can’t, don’t fret. I’m going to tell you my tips for getting the look of a professionally designed home on a budget. This is a hard thing to break to people who want “the designer look” without replacing anything. 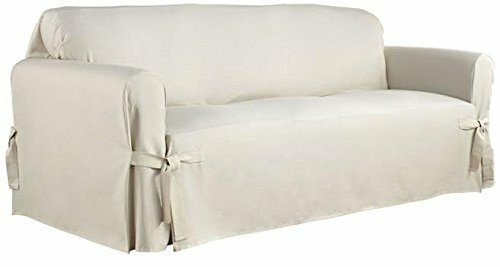 I have worked briefly as an interior decorator and it is hard to go into someone’s home and give them the look they want, but keep their 1980’s couch. 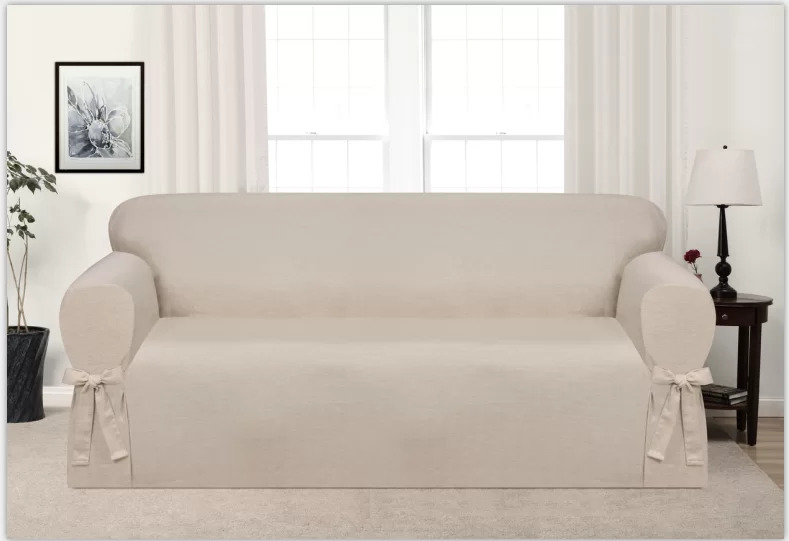 If you don’t have the money to buy new furniture, then consider slipcovering with a neutral color. If you try decorating around your mauve and green floral couch, you are going to spend money, but probably will still not achieve that look you see on Pinterest or in magazines. Matchy, matchy furniture that you can buy as a set at a furniture store would almost never be used by a professional designer. This includes matching coffee table and end tables or matching sofa and chairs. Now, personally, I’m okay with my sofa and love seat from a set, but I always want to add in a chair with a different fabric or print. It adds some interest to the room and the varying texture and color breaks up the monotony in a room. If you have a leather couch, consider a fabric chair with some interest. In my home, we have a leather sectional, but I have tufted fabric club chairs. Using different textures, wood tones, and materials really adds visual interest to a room. To do this right, look for similarity in the pieces of furniture. Below, I have some images from Inspiration Boards that I put together, you can see the entirety of these boards and other Inspiration Boards here. If you look at the sofa and chairs I’ve paired together in each board, they are very different, but they work together. The natural tufted sofa and plum chairs in the left image both share clean lines, where the natural chesterfield sofa on the right and leather club chairs both have more of a vintage feel. Sometimes pairing pieces together takes a special eye, but don’t worry if that’s not you, many furniture stores and catalogs already pair these things together for you. Pinterest is also full of pictures that you can use for Inspiration. If you check out my Pinterest Boards, I have boards for different styles, farmhouse, traditional, vintage, rustic, etc. You can find my boards here. This one is also important. You really need to consider the size of your room when filling it with furniture. If you have a tiny little living room, you might not want to buy that oversized sectional, if your living room is huge, you might need to splurge and buy more furniture to fill the room. A couch alone may look lost in a huge living room with high ceilings. For instance, you may want to instead get two sofas, or a sofa, love seat, and two chairs. You have to make the room feel like it’s not empty. You never walk into a professionally designed room and feel like you can do cartwheels through the space. Now, some people may want that in their living room because their child loves to do cartwheels. It’s your home, love it how you want! The image below is a good example of furniture that is sized appropriately for the room it is in. The room does not look too empty or too full, and the furniture pieces are the right scale for the ceiling height and the square footage. Bare windows leave a room feeling hard and cold. I cannot stress this enough. The addition of fabric in a room softens the feel of the room. It’s hard to explain, but I’ve witnessed what curtains can do to a room many times. I love a lit room, so I’m not saying cover your windows up. Just flank them with curtain panels. It can be done so inexpensively these days. Wal-mart, Target, Homegoods… All these stores and many, many more offer beautiful window coverings at an affordable cost. My rule of thumb for window coverings is, if you have a busy pattern in your rug, then I would look for a basic pattern or solid color curtains. 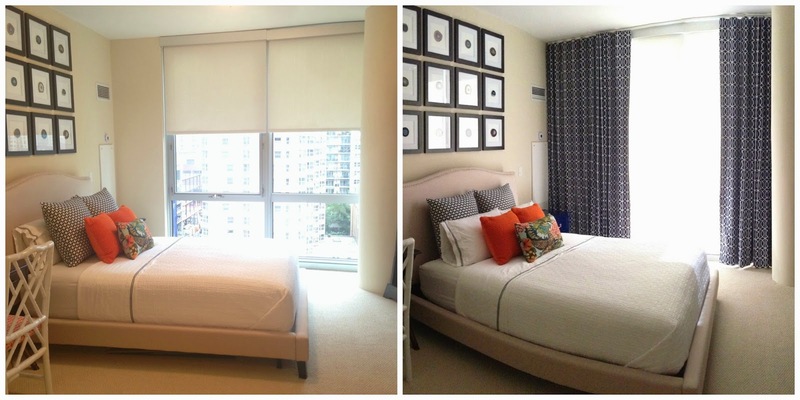 If you don’t have much pattern going on elsewhere in your room, patterned curtains can add some life to your room. This image below from Muckety Mucked is a good example of what the addition of curtains will do to the room. It just adds life and color in a way that you can’t get with anything else. It makes the room look finished. This is where it goes from decorated, to professionally designed. The link below the image even contains a tutorial on how to make lined curtains. They are very easy to make, but I know this from experience, if you can find a pattern you like available in the store, they are usually cheaper than making your own. Especially if you don’t have carpet, a rug will add color and warmth to your floors. Just like curtains on the wall softens a room, a rug over a wood or tiled floor will soften your room. A rug also anchors the furniture in the room, and it simply just warms up the feeling of a room. As you can see in the image below which was featured in Elle Decor and the design of the room was done by Laurel & Wolf Interior Design, the rug gives the furniture a place to call home, as opposed to just floating in the room. Which leads right into tip #4. Okay, so what does that mean??? As you see in the image above, the furniture is not all pushed against the wall. Unless the room does not allow it, most designers will pull the furniture away from the wall and float it near the center of the room. This creates a conversation area and leaves the walls open for shelving or console tables. The shelving and console tables make space for displaying your favorite books or knick knacks. As I said above, the rug anchors the furniture, but a mistake many people make is buying a rug that is too small for their space. 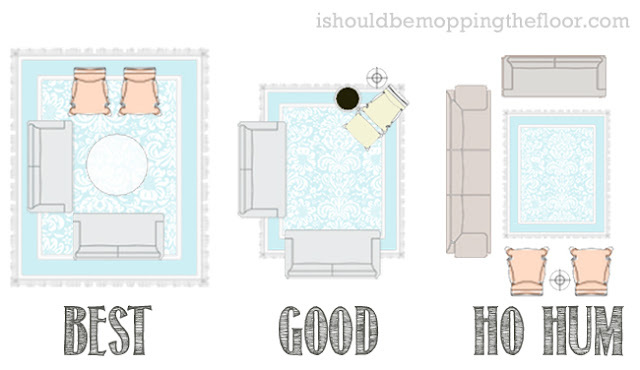 A good rule of thumb that I hear over and over is that you at least want a portion of your furniture on the rug. The “Good” visual below displays this. If you have the finances and the space to purchase a rug that all of your furniture can be entirely placed on the rug (the “best” option), even better. The diagram below from ishouldbemoppingthefloor.com is a great visual. Arrange your furniture how you would like it, and then measure the space you are working with to determine the rug size you would like. I like to look for rugs at Amazon.com, Overstock.com, Walmart.com, and Homedecorators.com (my personal favorite), and HomeGoods. If you look at the pictures in Home Design magazines the shelves and tables are never cluttered. They have knick knacks, but they are perfectly placed and they are limited. Less is more! Clutter is not your friend if you want your home to look professionally designed. Look at the image below from Refinery 29. It contains small knick knacks, but they are very thoughtfully placed. Again, look through Pinterest. I have a board called Styling. 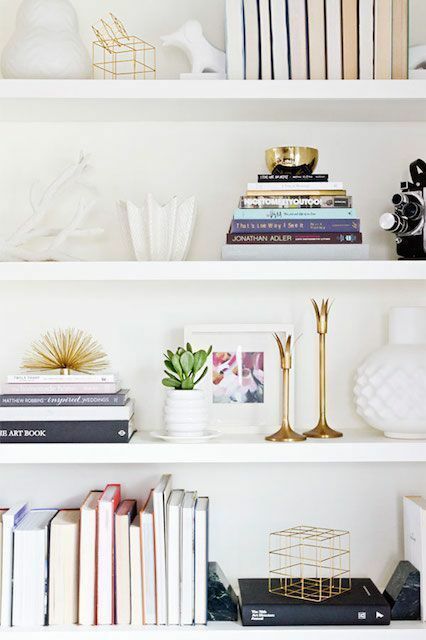 It’s full of inspiration for ways to style shelves and tables. Try to recreate what you see with things you already have. Things that are important to you, but (and this is key) not everything you own that is important to you. When trying to get your room to look like it was designed by a professional you have to add art, and the art has to be the right scale for the wall. If you have a 4×8 foot open space on a wall, and you hang two 8×10 inch frames on the wall, those 8×10 frames are going to look lost. You need to select artwork that fits the scale of the wall. The image below is from an article on Emily Henderson’s blog. 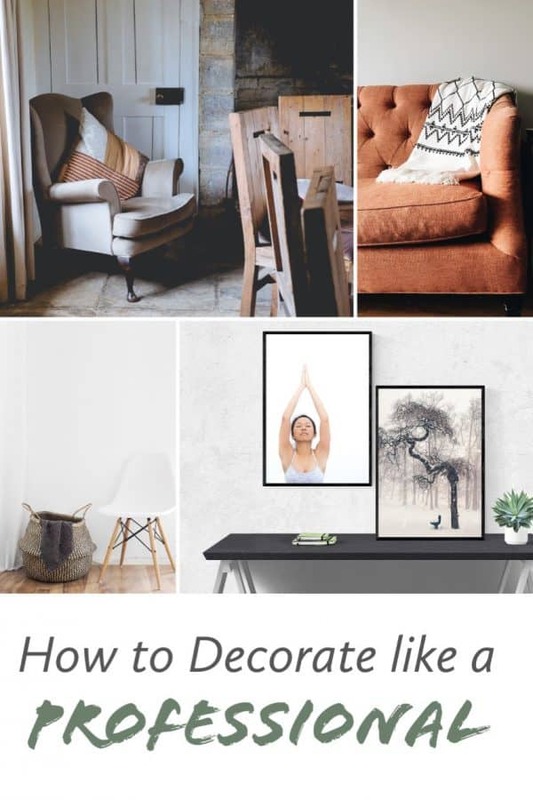 She has wonderful tips on how to and how not to hang art, along with other design dos and don’ts. The art in this image is just too small for the wall it is on. Now, you may be thinking, but I can’t afford large scale art. 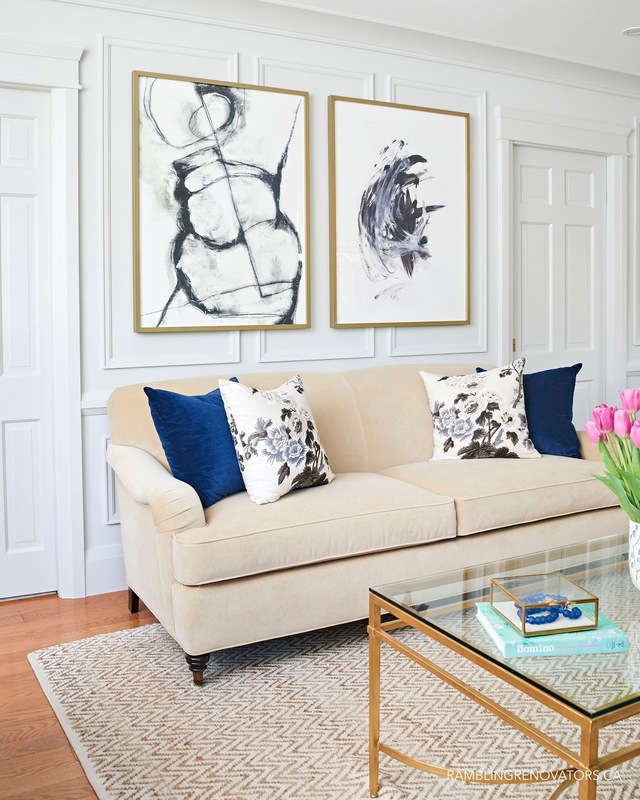 There are so many ways to get inexpensive large scale art, or ways to group smaller art to fill a wall. I have become a big fan of printing art. It can be done very cheaply. I have a blog post titled “How to print Large Scale Art (and other sizes)” that will walk you through printing large scale art. You can also find large scale art at Target, HomeGoods, and many other retail stores at affordable prices. The room below is beautifully decorated with large scale art above the sofa. This room, which was decorated by Rambling Renovators, is a great example of how large scale pieces of art that match the scale of the wall add so much visual appeal to the room. I highly recommend checking out the rest of their renovation. It is beautiful! If you don’t want large pieces of art, create a gallery wall. A gallery wall will give you the scale you need, but it allows you to purchase smaller pieces. 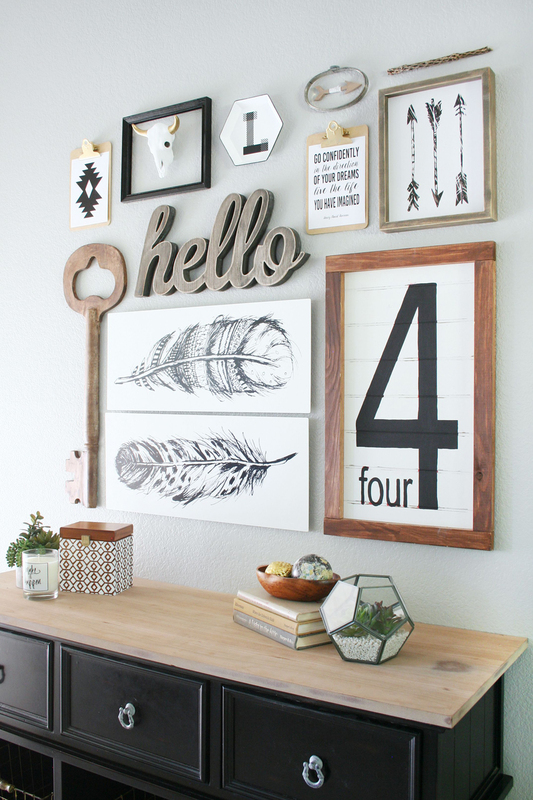 You can create a gallery wall using many different mediums. Framed art of your family. wall hangings, signs, home decor pieces. objects that are meaningful to you, etc. The image below from The Crafted Sparrow is a great example of an eclectic gathering of art that fills the wall space, but also brings fun and design sense to a room. 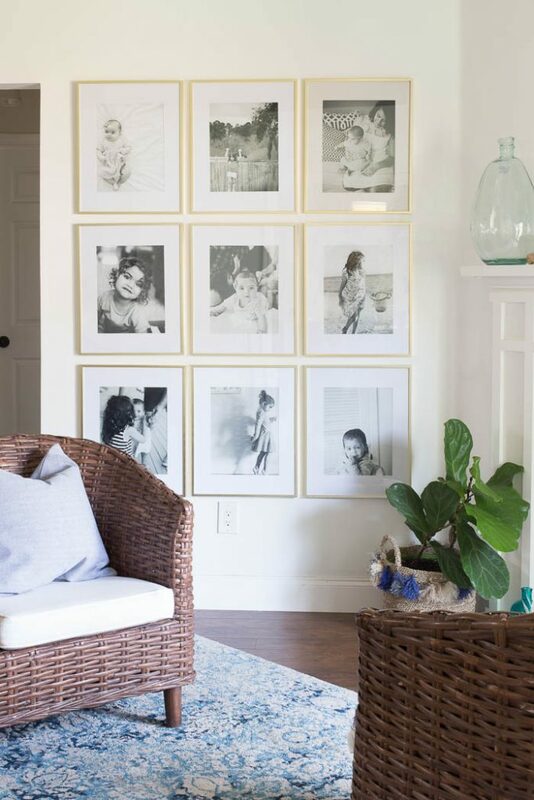 If you like things more symmetrical, use picture frames to create a grid style gallery wall. 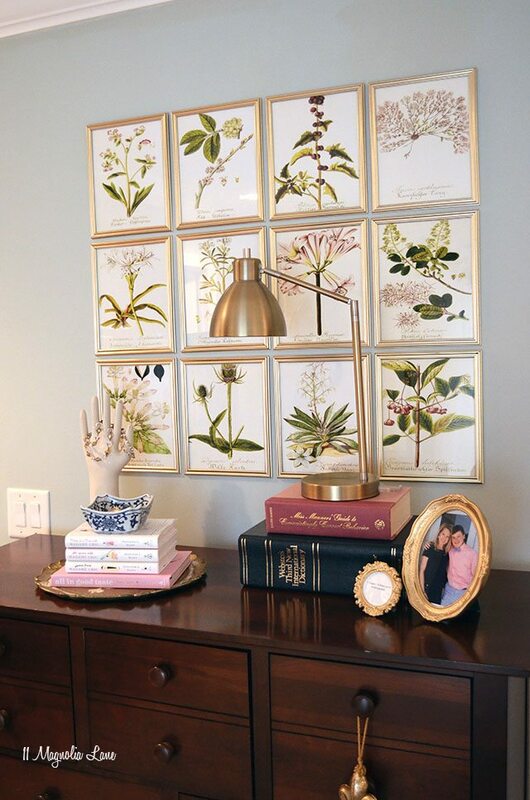 You can do this with family pictures, botanical prints, art collections, etc. This is a wonderful way to fill a large space. 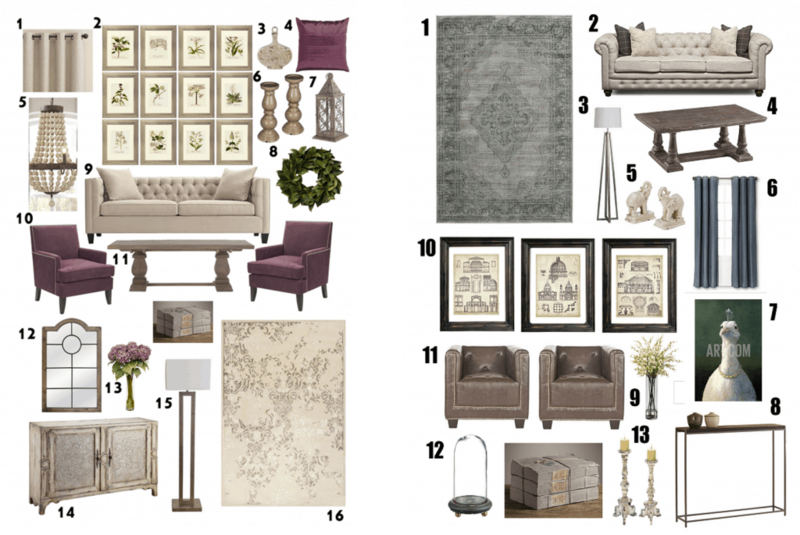 I have to show this next example of a gallery wall with free printables, because she used mine! It will always make me giddy when someone makes something beautiful with something from my blog:). You can find these free printables here. Eleven Magnolia Lane was able to put together this gallery wall that filled this large space above her dresser, by simply printing these images and framing them with Dollar Tree Frames. This was a very cost effective way to fill this space and it looks beautiful! If you click on the Free Printable Art tab at the top of this page, I have more free ready-to-print art to create gallery walls. Also, if you browse “Free Printables” on Pinterest or open my Printables Pinterest Board here, you will find a great wealth of free printable art that you can use to create a gallery wall. Also search for “Gallery Walls” in Pinterest and you will find ample inspiration to create your own. Last, but certainly not least, add your personality! Throw in your quirks and your faves. Add that funky throw pillow you love, or that piece of art that caught your eye. Don’t go into a home design store and buy everything they’ve put together, even though it’s not you. Search Pinterest, find your style and run with it. These rules I’ve put forth are basic, the style and personality have to come from you. « Step-by-Step Tutorial to Print Large Scale Art (and other sizes). Thank you so much I have truly enjoyed my visit with you. But most of all I have learned a lot from you. Thank you again and I hope to be reading more of your story’s.